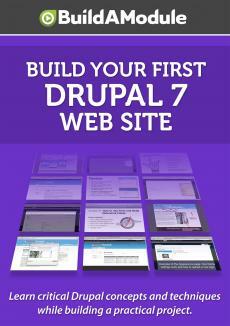 There are several ways to install a Drupal module. We're going to explore two, and we're going to begin by looking at the automatic way we can do so using the Update Manager module that comes with Drupal core. The other way is to install a module manually, and we'll explore that a little later on in these videos. So let's begin by installing the Update Manager module. I'm going to go ahead and scroll down. Notice that the modules are in alphabetical order, so this should show up near the bottom. Sure enough, here it is, Update Manager. I'm going to go ahead and click this check box next to it and click save configuration. This will go ahead and install the module. And once it's done, you will notice a new link at the top of the page that says "install new module. " If you click this, you'll see that we have a couple of options for installing the module. First, we can install from a URL, and it gives us an example of the type of file that it's looking for, right here. Or, if we wanted to upload it manually, we could use this form here, after downloading it to some download folder on our computer, and then upload it and install it automatically from there. We'll go ahead and get this link from Drupal. org for the Webform module, which is the module that we're about to install, and we'll go ahead and use the "install from a URL" option. I'm going to go ahead and open up a new tab in my browser, and then I'm going to do a Google search right up here for Webform Drupal, and that should be enough to pull up the Webform module. Sure enough, here it is. I'm going to go ahead and click on this link. Now we know that we're on a module page because we are on the modules tab here. There's a few other signs, and we'll go over this page and how to use this page in detail later. Let's go ahead and scroll down to the bottom first.